Click on any CURRENT EVENT links which attract your attention! Read details regarding our annual Saint Joseph Altar (March 16-17). 2018-19 Registration Packets have been mailed to families of children who were enrolled in our program last year. Extra copies of the packets may be picked up in church and in our church parish office or downloaded from this page. Our Parent Orientation Meeting was held in our church parish hall at 6:15 p.m. (after 5:00 Mass ended) on Sunday, August 26. Fr. Metrejean has linked two videos (presentations by Fr. Metrejean and Paul George) to the homepage of our website. NOTE: The date of the September 23 Confirmation luncheon was changed to September 16 shortly after the Parent Orientation Meeting ended. Volunteers who work with the children in our programs must maintain up-to-date Safe Environment certification. Dates for this year's training sessions have been announced: Monday, September 10; Wednesday, September 19; and Tuesday, October 9. All Safe Environment training sessions will begin at 6:30 p.m. in Conference Room A in our Church Parish Office. Please call our church office to register for these meetings. 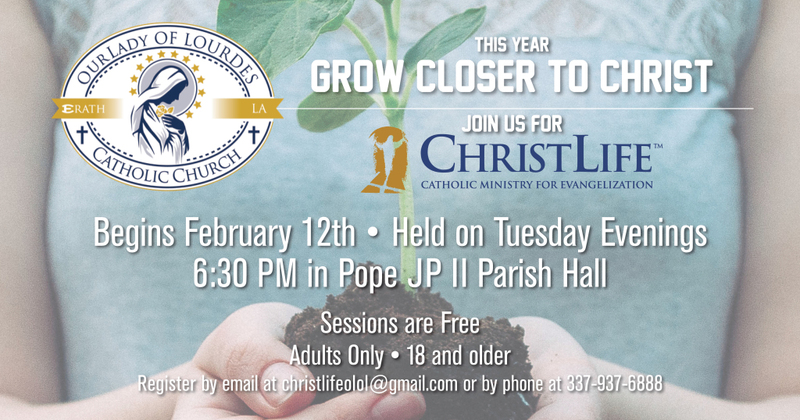 Volunteers who are planning to attend the Initial Training sessions must fill out paperwork required by the Diocese of Lafayette. To expedite the paperwork, new volunteers are encouraged to bring the following contact information to the training sessions: names, addresses, and phone numbers for two work/school references and two character references. Initial Training volunteers must also provide their Social Security numbers for a mandatory background check. Volunteers who have completed on-site Initial Training in the past and are now eligible for online Continuing Education will find helpful links at the bottom of this page. Our church parish has, once again, subscribed to FORMED.org,, a website filled with plenty of online Catholic resources for people of all ages. At no extra cost, parishioners can enjoy watching faith-based movies and informational videos, listening to audio talks, and/or reading online books wherever you may go. Besides having access to FORMED on your home computer or laptop, a free app is available for smart phones and tablets. Go to ololcatholic.formed.org and call our church parish office for our parish access code to create your personal profile and gain access to FORMED.org. The Fall 2018 schedule of on-site Safe Environment training sessions will be posted soon. Safe Environment Training for adults (age 18 and older) who wish to volunteer in our Religious Education and/or Sacramental Prep programs:. A first-time volunteer must attend an on-site Initial Training Session. (Please call our church parish office for information regarding and/or to register for an upcoming training dates.) To make efficient use of your time while filling out the necessary paperwork for the Diocese of Lafayette, please bring names and contact information for two personal and two work-related references. First-time Continuing Education users of the diocesan-approved Virtus program.